It was a popular misconception that Christina Olson, depicted in Andrew Wyeth’s “Christina's World” (1948), had polio. In one of the most iconic paintings of the 20th century, Andrew Wyeth’s “Christina's World,” a young woman is sprawled in a grassy field staring longingly at a gray farmhouse in the distance. Painted in 1948, the work has long been thought to contain a medical mystery. Many assumed the subject—Christina Olson, the artist’s neighbor, who was disabled from the waist down, had suffered polio. But now, thanks to medical sleuthing, a Mayo Clinic pediatric neurologist has diagnosed Olson’s condition as an early-onset form of Charcot-Marie-Tooth (CMT) Disease, a group of inherited disorders that affect the peripheral nerves, leading to progressive muscle degeneration and significant problems with movement. Olson’s diagnosis was presented in May 2016 at the University of Maryland at the Historical Clinicopathological Conference, an annual academic gathering where clinicians unravel a medical mystery from historical figures. Past meetings have focused on the unknown illnesses of Mozart, Joan of Arc, Abraham Lincoln, and Alexander the Great. “We’re teaching medical trainees problem-solving skills by working with these difficult cases,” said Dr. Philip Mackowiak, the conference’s founder, a physician and epidemiologist at the University of Maryland. While examining Christina Olson from “Christina’s World” was the first time the conference had tackled a medical case drawn from art history, many famous works of art have been analyzed through the years, including Rembrant’s “Bathesheba” (breast cancer) to Corot’s “Gypsy Girl with a Mandolin” (rheumatoid arthritis). In fact, in an exercise known as “Diagnosing the Canvas,” physicians diagnose the illnesses of the subjects of paintings, as well as historical artists, in part as an intellectual exercise to test their skills of observation, but also to increase the understanding of the history of diseases, publishing their work in scientific journals. 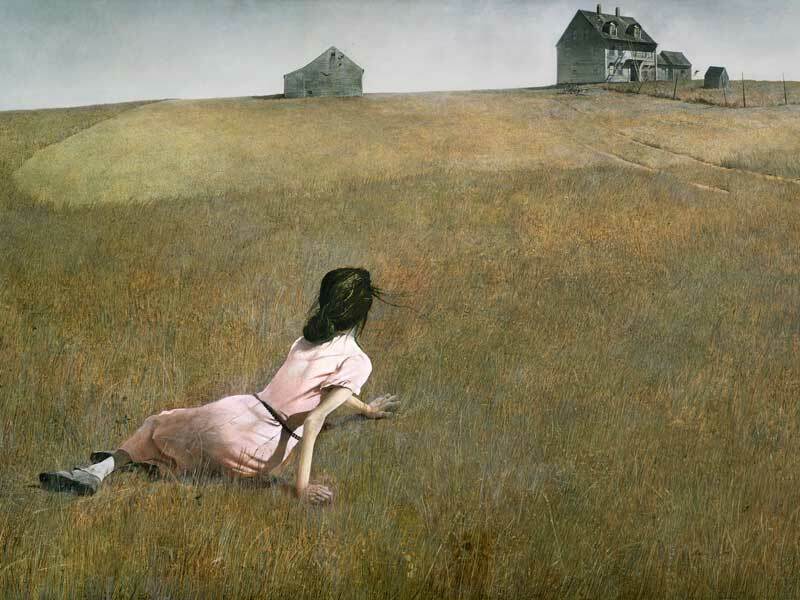 Andrew Wyeth was inspired to paint “Christina’s World,” after seeing Olson, his determined neighbor, crawling through a meadow outside his window. While the cause of her paralysis was never diagnosed in her lifetime (she died in 1968 at the age of 74), it was long believed that Olson had been crippled by polio, a common cause of childhood paralysis until a vaccine was developed in 1955. But a biography written by her nieces, described their aunt’s condition in enough detail to lead medical experts to rule out polio. Another clue was that paralysis from polio is often asymmetrical, leaving one arm or leg severely weakened. In Olson’s case, her paralysis was symmetrical. From these additional medical details gathered from the biography, experts recently concluded that Olson had Charcot-Marie-Tooth Disease, a hereditary condition of the peripheral nerves that afflicts about 2.8 million people worldwide. In Corot’s “Gypsy Girl With Mandolin,” medical experts observed that the girl’s gnarled hand might be an early depiction of rheumatoid arthritis, an autoimmune disorder that affects the joints. In a study appearing in the Journal of the American Medical Association in 1990, experts also suggested that Corot may have suffered from gout, a joint disease, making him sympathetic to the symptoms of his subjects, and leading him to depict their conditions in his art. This famed oil painting by Dutch artist Rembrandt (1654) had long been held up as symbol of breast cancer’s history. In the painting, the model has a large blue mark under her breast and swollen left armpit, which was originally interpreted by medical experts in the 1980s as a cancerous tumor. Scientists at the University of Twente, in the Netherlands, however, used computer simulation to prove that it was impossible for a breast cancer tumor to produce a blue color on the breast. Simulating millions of light particles – called photons – shot on a breast tumor, they found that to produce the blue coloring, a breast tumor would have to be located one to three millimeters under the skin. In general, most breast cancer tumors are located much deeper under the skin and do not show color. The study turned out to be a case of art affecting science: the light imaging techniques used to analyze Bathsheba are being further developed as modern tools for breast cancer diagnosis.